X Factor winners Little Mix have blasted to the top of the Official Singles Chart with debut release Cannonball shifting over 210,000 copies in its first week. The release achieved the biggest first week sales for a single so far this year - outselling the rest of this week's Official Singles Chart Top 5 combined. Little Mix were the first ever girl band to reach an X Factor final. Irish folk-singer Damien Rice had the talent show to thank too this week. His original Cannonball - which peaked at 32 when first released in 2003 - was re-released and reached number 9 in October after featuring on X Factor. 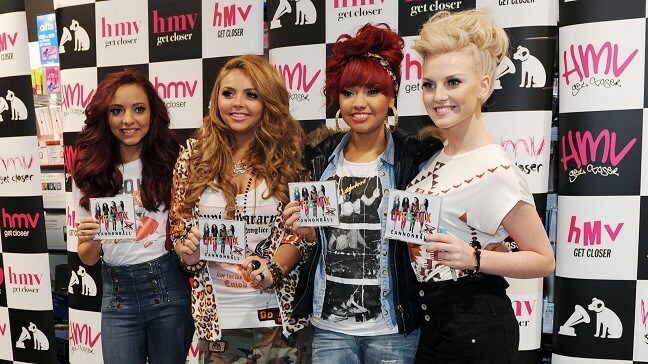 It re-entered the singles chart at number 19 thanks to Little Mix's cover. En Vogue's Don't Let Go (Love) also received a boost this week courtesy of Little Mix's performance of the track on X Factor final night, climbing to number 27 from last week's 89. There was just one new entry in this week's Top 10 - Leona Lewis, herself an X Factor winner back in 2006, crashed straight in at number 8 with her cover of Hurt, a song written by Nine Inch Nails but made famous by the legendary Johnny Cash. In the albums chart, Grammy winning Canadian superstar Michael Buble's festive album Christmas scored the biggest weekly sales of any album this year so far. More than 269,000 copies were sold in the last seven days, a week-on-week sales increase of over 42%. Rihanna has revealed she was the victim of racist abuse in a hotel in Portugal. Selena Gomez was forced to cancel two concerts at the weekend due to a "family emergency". Music stars have paid tribute to Amy Winehouse as they celebrated some of the world's top divas. Little Mix's chart-topping single has achieved the worst first week sales for an X Factor victor's winning song since 2004, figures show. Strictly Come Dancing winner Harry Judd is preparing to get back behind his drum kit despite admitting he had fallen "in love" with ballroom dancing. Chart-topping acts are to be given a new award to recognise their achievement. The race for Christmas number one pitches four of the country's newest singing stars against some of its most unlikely ones. McFly stars are set to dominate TV even further following Harry Judd's Strictly win by appearing in a celebrity special of Who Wants To Be A Millionaire?.